Here’s a complete list of all U.S. Amex Centurion Lounge locations, including detailed information on exactly where to find each lounge in your airport. We’ve also listed hours of operation, square footage, the professional chef responsible for designing each lounge’s specific cuisine, and any specialty amenities which are available. Finally, if you’re wondering how to access these Centurion® lounges, information on eligibility & pricing is listed at the bottom of the post. 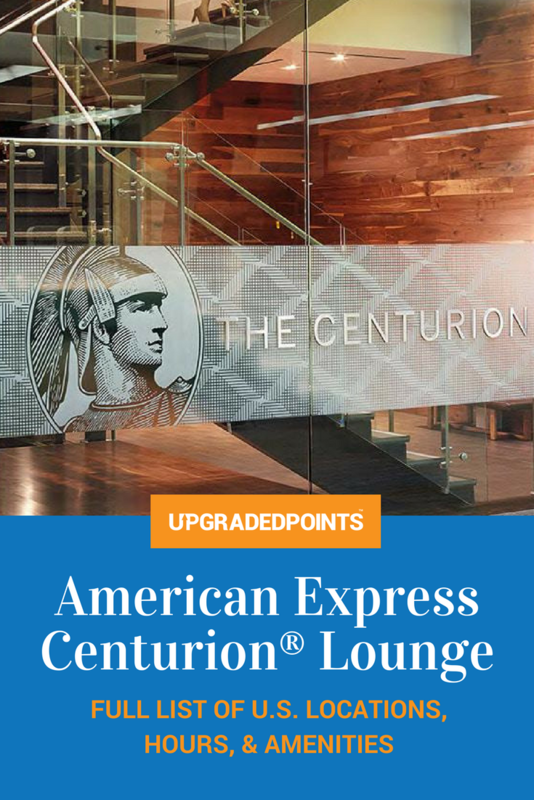 In short, to access the Centurion Lounges you’ll need to have either The Platinum Card® from American Express, The Business Platinum® Card from American Express or the Centurion® Card from American Express. Does Adding an Authorized Cardholder Make Sense for My Family? 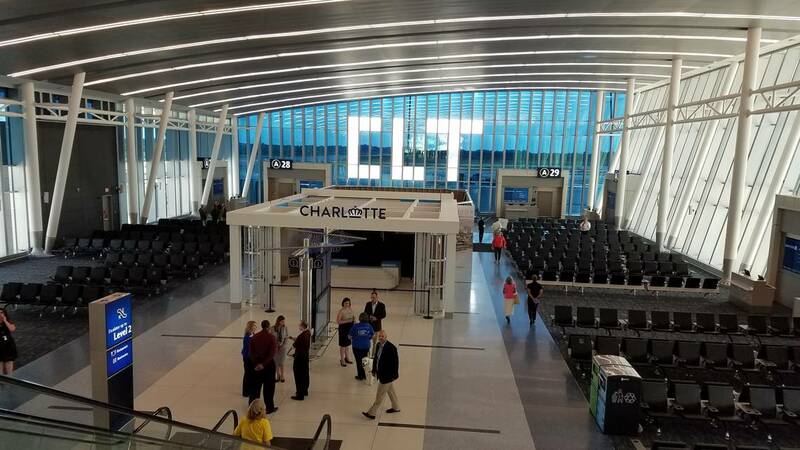 CLT to get Amex Centurion Lounge in 2020. Image courtesy of charlotteobserver.com / Ely Portillo. Buffet & Bar Area at the newly renovated DWF Centurion Lounge. Image courtesy of thecenturionlounge.com. 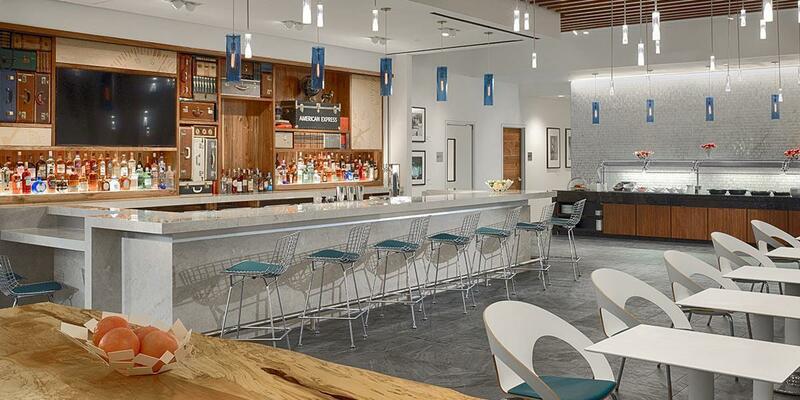 Hot Tip: For even more information on this lounge, check out our dedicated guide to the DFW Centurion Lounge! 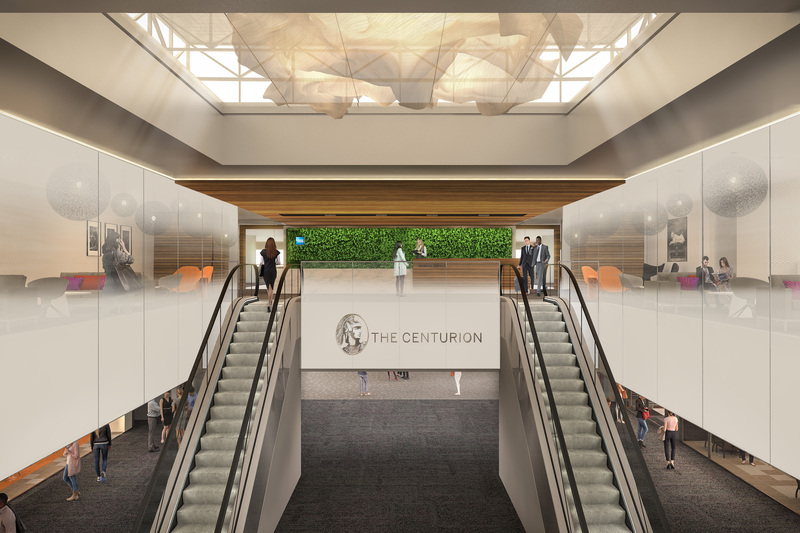 Rendering of The Centurion Lounge entrance at DEN. Image courtesy of about.americanexpress.com. 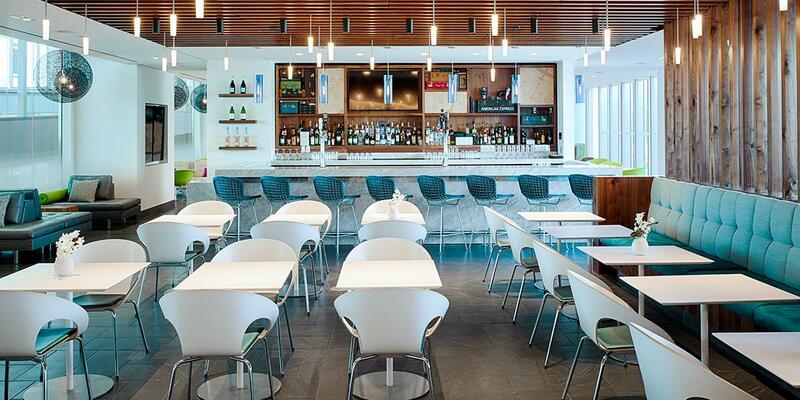 The Centurion Lounge bar & dining area at IAH. Image courtesy of thecenturionlounge.com. Part of the lounge/seating area in The Centurion Lounge at LAS. Image courtesy of thecenturionlounge.com. 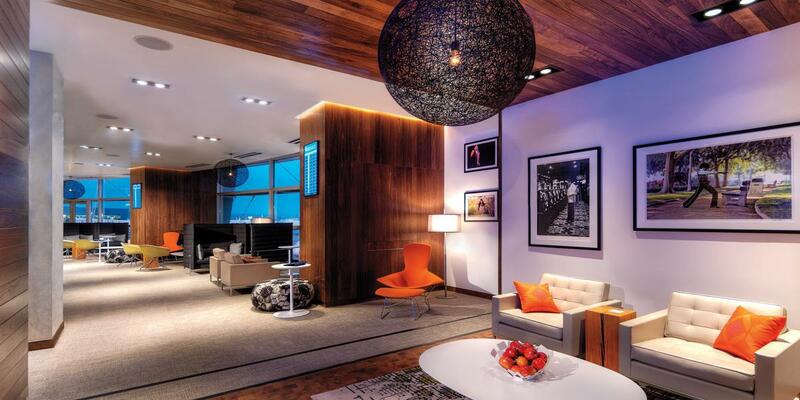 Lounge area at The Centurion Lounge, MIA. Image courtesy of news.miami-airport.com. 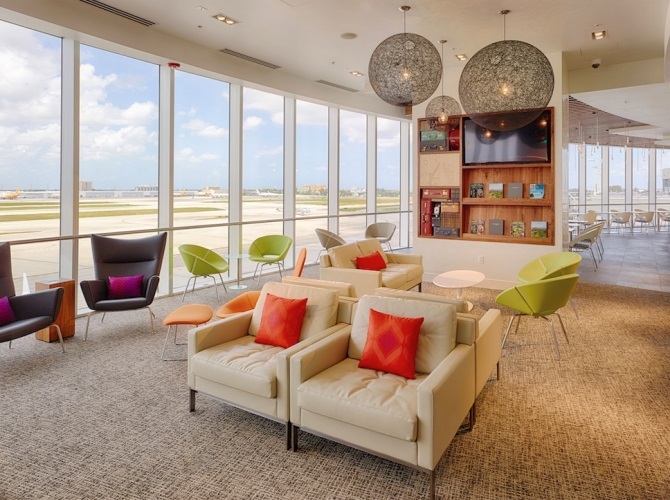 Hot Tip: For more information on this specific Centurion Lounge, check out our piece: The Miami Amex Centurion Lounge – Location, Hours, Amenities & More. A rendering of the entrance to The Centurion Lounge at JFK. Image courtesy of about.amazon.com. A quiet nook at The Centurion Lounge, LGA. Image courtesy of thecenturionlounge.com. 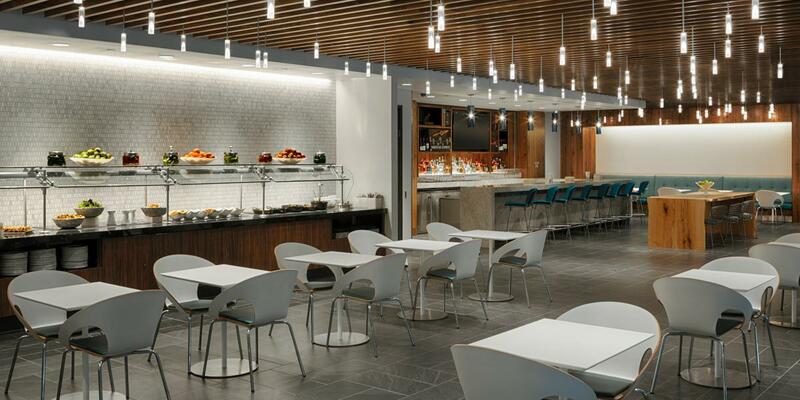 The Centurion Lounge at PHL bar and dining area. Image courtesy of thecenturionlounge.com. Entrance of The Centurion Lounge at SFO. Image courtesy of aredesignawards.com. 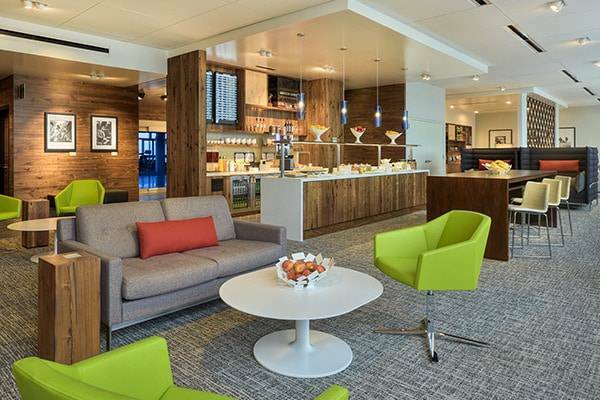 The lounge area and buffet at The Centurion Lounge, SEA. Image courtesy of thecenturionlounge.com. 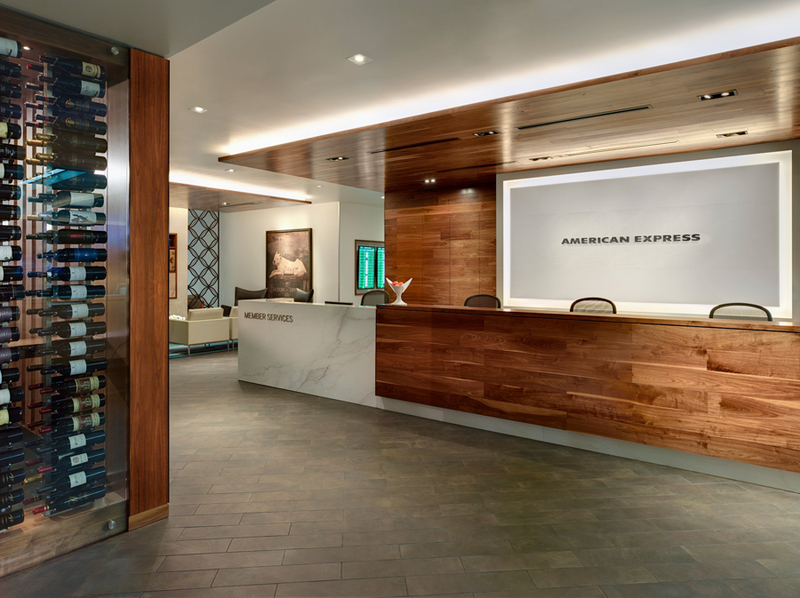 Entry to any American Express Centurion® Lounge is complimentary for cardholders of The Platinum Card® from American Express, The Business Platinum® Card from American Express, and the Centurion® Card from American Express. Hot Tip: If you’re interested in access to other lounges outside of the Centurion Lounge group, check out our article on Best Business and Personal Credit Cards for Lounge Access. 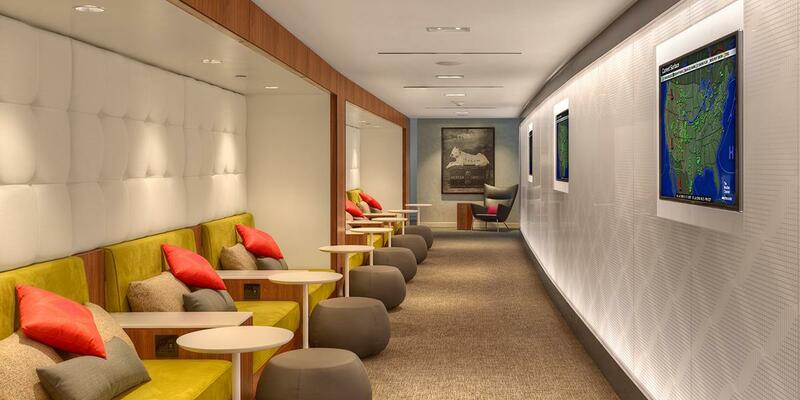 All Centurion Lounges will become “day of departure” lounges. This means arriving Platinum Card Members with boarding passes for flights that have just landed will not be admitted. 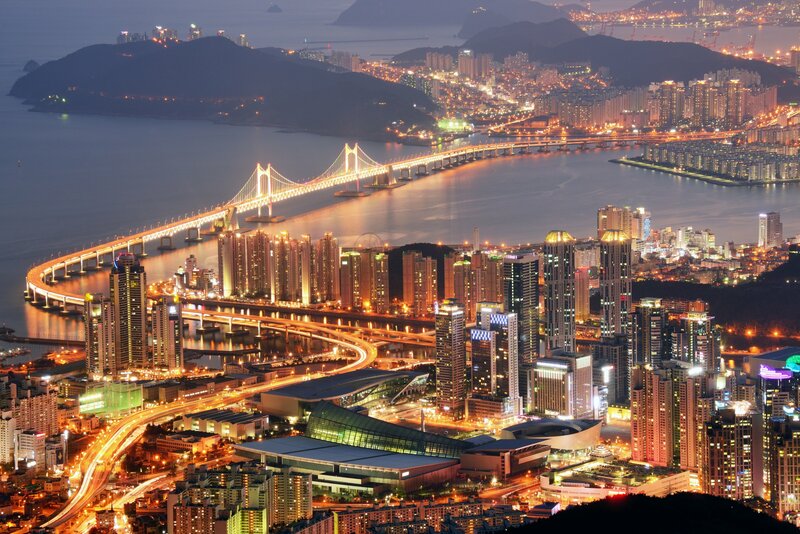 Platinum Card Members with layovers or connecting flights who produce proof of connecting flight will be admitted. Platinum Card Members will not be admitted more than 3 hours before the departure time on the Platinum Card Member’s same-day, confirmed boarding pass. Does not apply to Platinum Card Members w/ connecting flights. Children under 2 y/o will be admitted free of charge if the accompanying parent/guardian can provide a “lap infant” boarding pass or proof of age. The Platinum Card® from American Express and Centurion® Card from American Express members may purchase a $50 USD day pass for any additional guests. One Day Pass for non-cardholders: No longer available as of October 2, 2017. * Guests must enter with a valid cardholder. 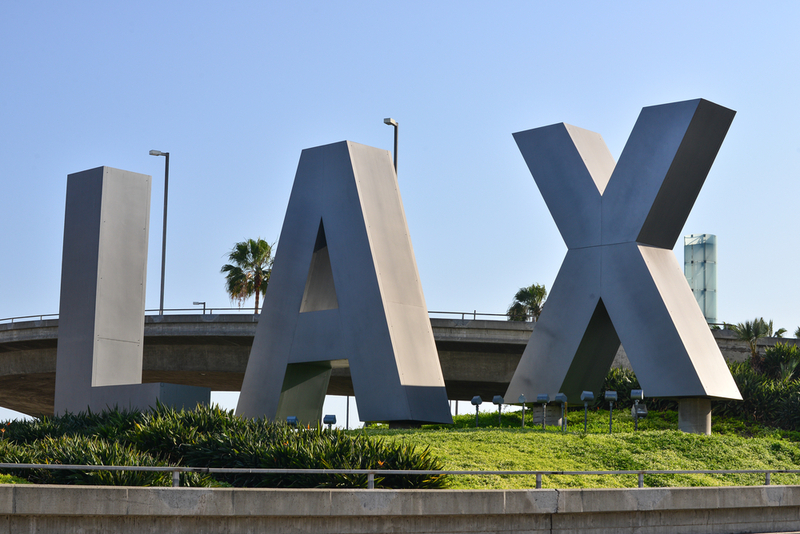 Recent changes to the guest policy have certainly made it difficult for families of 4 or more to access a Centurion Lounge. As mentioned above, the guest policy for Platinum Cardmembers currently allows access for the cardholder and up to two guests. Each guest thereafter is $50 (aside from children aged 2y/o and under, starting 3/22/19). So, if you’re a family of 4 with only one Platinum cardholder, you will pay $50; families of 5 will pay $100; 6 will pay $150 and so on. ‘With only one Platinum cardholder’, is the key phrase here. The solution? Adding an authorized cardholder to your Platinum Card. 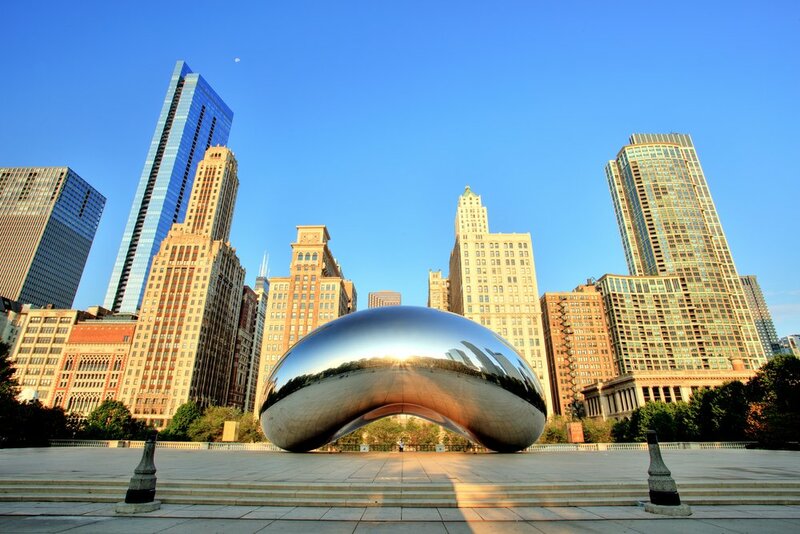 American Express charges a fee of $175 to issue an additional Platinum Card to up to three authorized cardholders. In most cases, if you’re a larger family and your travels involve your partner and children, it makes sense to add your partner as an authorized cardholder in order to gain additional guest access. Those who don’t travel with a partner but still travel with children should note that American Express sets the age limit for authorized cardholders at 13 y/o. Therefore, if you have a teenager or an adult child you often travel with, it may be worth adding them as an authorized cardholder. *Keep in mind this is considering your children are over the age of 2. Adding a cardholder to your account is not a decision that should be made lightly as their card is subject to the same terms/agreement your card is subject to. This means American Express holds you responsible for all of the purchases made by the authorized cardholder and they reserve the right to report any authorized cardholder’s use of your account to credit reporting agencies, among other agreed upon terms and conditions. If you’re adding an authorized cardholder to your account, you’ll want to be sure they’re acting responsibly. Can I use the Centurion Club while traveling using my flight benefits with a confirmed seat? I’m a United Airlines employee and AX Platinum card holder. I spend well over $25k per year on my card as well as pay the $500 annual fee. 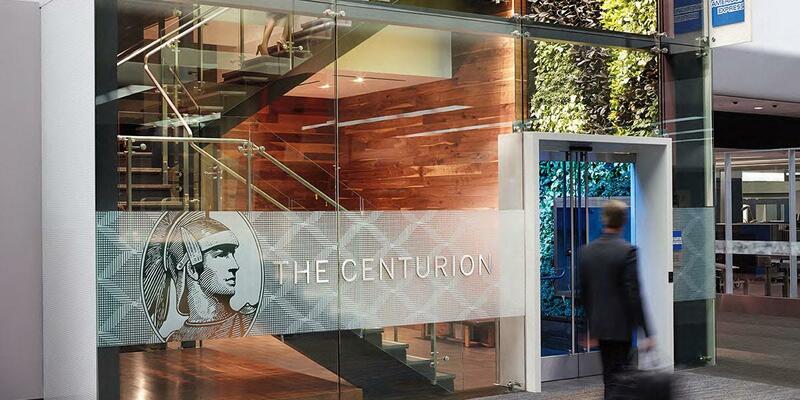 As long as you have a same day boarding pass, you can access the Centurion lounge. If you forget your Platinum card at home, you can have them look it up via the last 4 of your SSN and some verification questions. They do not care which airlines you fly with. I’ve personally flown on Spirit, and literally nobody bats an eye. 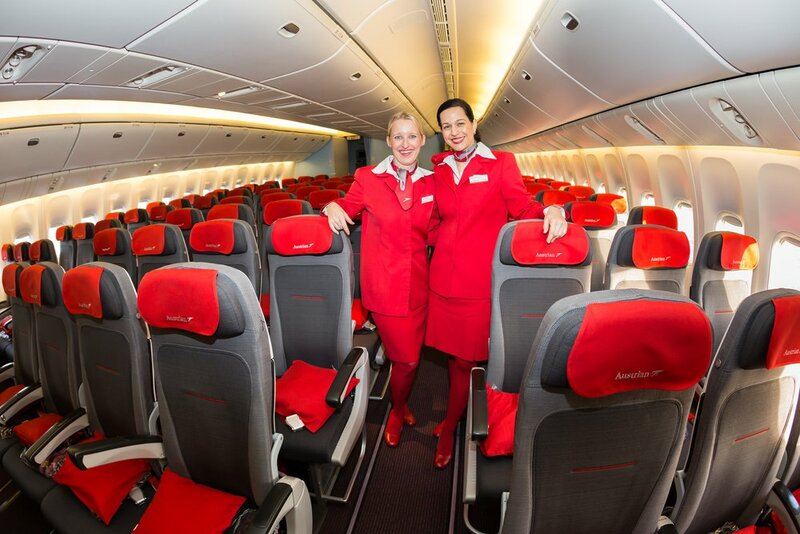 That’s the great thing about not being associated with a specific airline! Thanks for reading! We’re a family of 5. There’s really no point of this lounge if we can’t all go in, right? Because, there is no way we’re paying an extra $100 for our 8 and 10 yr olds. Hi Donna, unfortunately when Amex tightened their restrictions in 2017 in attempts to battle overcrowding issues they imposed the strict 2 guest limit for those with a Platinum Card. In March of this year, they’re updating those restrictions to state “We will admit children under 2 years of age free of charge, provided an accompanying parent or guardian is able to produce a “lap infant” boarding pass or proof of age.” Unfortunately, this won’t apply to your 8 & 10 yr old children. However, there is an alternative to this which you could be interested in depending on how often you would want to utilize the lounge. If you plan to use the lounge more than once a year, it may be worth paying a $175 fee (current at the time of answering this comment) for another member of your family (limited to individuals 13 yrs & older) to get an “Authorized User” card. This fee actually covers up to three additional cards. Again, if you travel fairly often and will use a centurion lounge two or more times, it may be worth adding your wife as an authorized user for the $175 fee as she will then also be allowed 2 guests, which means as a family of 5 you should be taken care of. Hope this helps!!! Hey Michael, thanks so much for bringing this to our attention – we’re going to completely edit out this section for now until we can confirm with our source where the original information here came from. Definitely don’t want to lead anyone astray! Unfortunately for me, I have a business Platty and the cost is $300 per person! Yikes! Thanks so much for the confirmation Kristi! I was planning on calling this upcoming week as we’ve just arrived home from an international trip yesterday afternoon and I was wayyyy too jet-lagged to attempt to call a customer service line! Guest access is, indeed, per cardholder NOT per card member. This means each authorized user or cardholder is allowed two guests. So, a family of 5 or 6 could utilize the lounge at no additional lounge fees if they have two cardholders present (allowed two guests each). Again, this was confirmed multiple times by member services upon calling in to request the most up-to-date info. Where can I find a list of Global Collection Lounges for countries outside of the US? I find it difficult to accept a reduction in benefits without an accompanying reduction in price. When you first opened the rules were more liberal and you convinced more people to take the card. The people who put the lounge program together should have done a better job of evaluating the potential card holder access requirements and sizing the lounges a accordingly. Of course it’s easier to take a benefit away from your customer instead of biting the bullet and fixing the problem, but beware of the backlash. We’re a travel blog, and not Amex. Thank you though for voicing your concerns!